Its a good thing I love Fall because last week we went to 3 Pumpkin Patches! 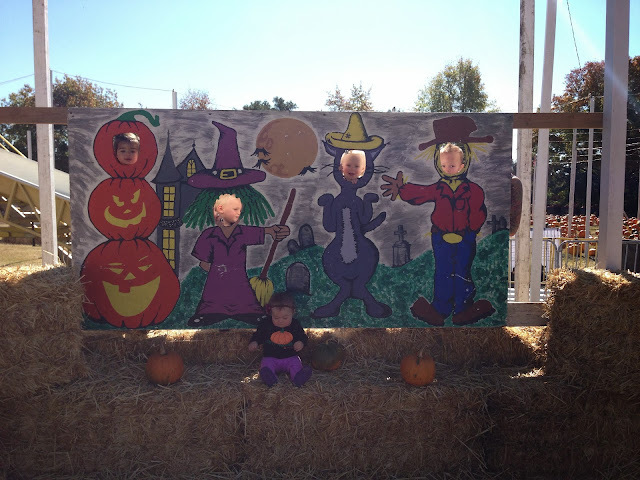 Sunday I already blogged about, then Tuesday we met at Punky's Pumpkin Patch for playgroup. There wasn't a whole lot for the kiddo's to do but we of course tortured them with lots of cute pics. Then on Thursday a few of us went to the Santa Rosa Pumpkin Patch. This one was super cute. It had a huge corn pit, petting zoo, hay rides, and great wagons to wheel the babes around in. Today was one of those perfect days that makes me wish that I was a stay at home mom. Usually I'm pretty content working my 4 days a week and being with my family the other 3. Don't get me wrong I miss Lily like crazy every minute that I'm at work but right now I enjoy working and providing for my family. Hopefully in a couple years I'll be fortunate enough to stay home if/when baby #2 comes along. Back to today. 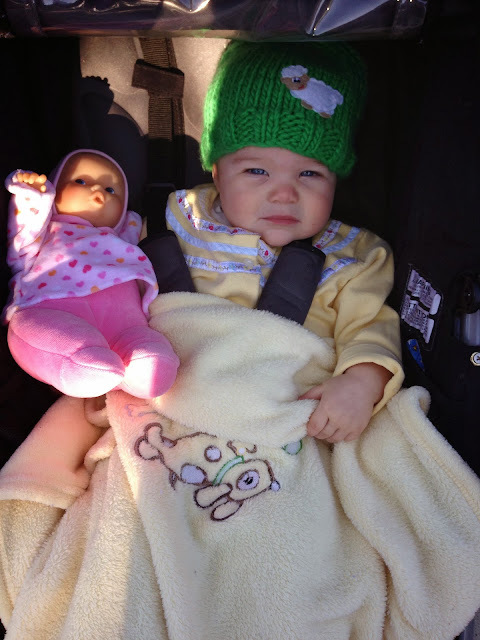 Lily woke up in a great mood, we took a nice long walk/jog with Rufus before Lilys morning nap. I caught up with my brother while she napped and got ready for the day. We then met a friend at a new park and the babes played, snacked and got lots if fresh air & sun. After the park we came home, ate lunch, played and Lily took her afternoon nap. Then we walked to meet friends at pump it up (an indoor inflatable playground) which is just around the corner from us. Lily loved it! Such a fun day. Yesterday we met some friends at Mcclellands Dairy Farm which turns into a great pumpkin patch/fall playground for kids at this time of year. There was a corn maze, petting zoo, 'seed' sand box, and huge area to pick your own pumpkins. Lily had a great time (and so did we)! Sometimes the best thing about being a new parent is reliving your own childhood memories! Can't wait to go to another pumpkin patch tomorrow with playgroup! Fall is here and its my favorite time of year. Although it was 85 yesterday and in the high 70's today...it still seems like Fall with the cool, crisp nights and changing colors. Also since its October that means I can officially dress Lily in Halloween gear. I bought these super cute ghost pj's a couple weeks ago when Gap was having a big online sale. These pictures are from a week ago when she was fighting a cold so forgive the snotty nose.